~ AND to see the world-famous azaleas at their peak! NOTE that there are a few CHANGES this year in the Garden Fair layout and hours. Most importantly that Friday afternoon is now open to ALL. Although Friday morning is FONA members-only, you CAN sign up to be a FONA member onsite to get first dibs on the plant sale. 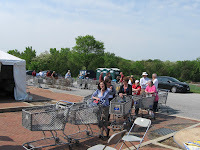 Pictured here is the line of eager FONA-member-shoppers ready to go at last year's opening bell. 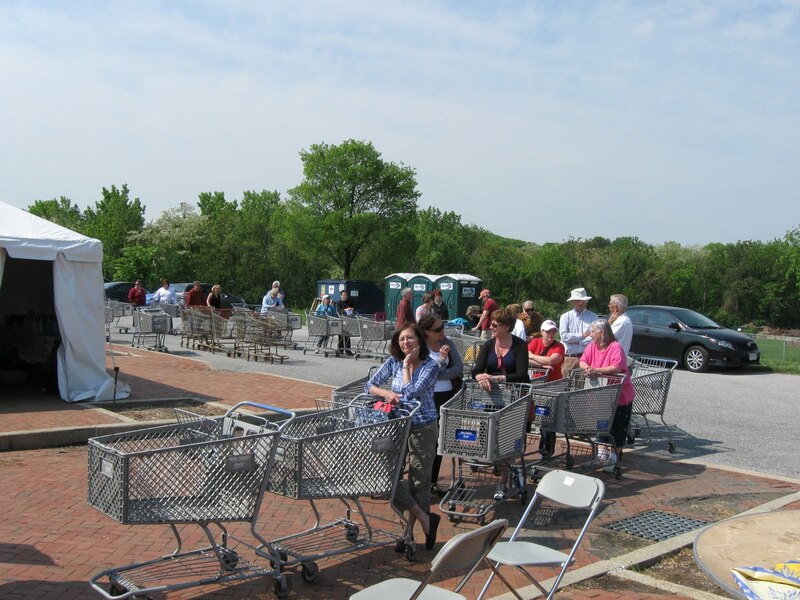 I heard they have obtained even more shopping carts this year so you can load up and roll out. And yes, Washington Gardener Magazine will have a vendor booth fair this year again. Stop by and see us to subscribe, renew, buy back issues, etc. Here are some scenes from last week's Mt Cuba Center day trip with Washington Gardener Magazine. The tour was coordinated by Cheval's 2nd Act and hosted by Behnke Nurseries. Three other tours are planned this year, see http://www.chevals2ndact.com/ for details on the upcoming dates. This video is mainly of the Mt Cuba lower pond area. You'll see Virginia Bluebells, Quaker Ladies, and Swamp Pink. See my Facebook album here for even more wildflower images from last week's tour. The Spring 2011 issue of Washington Gardener Magazine is now printed, out, mailed, and in area book stores such as the USNA Arbor House. To subscribe today and start with this issue, see this page link. The cover story is on Cutting-edge Garden Design. We explore what garden trend are on the horizon and what factors are impacting those changes. The cover photo is the Grand Prize winner of our annual Garden Photo contest. Inside, you’ll find the other 16 winners and information on the photographers. From beginning amateur to accomplished professional, all levels were represented in this fine grouping. To subscribe, go to www.washingtongardener.com/index_files/subscribe.htm and use our PayPal credit card link. We made seed bombs with Aunt Kathy today. We mixed compost, water, clay, and flower seeds. The flower seeds included Zinnias, Marigolds, Cosmos, and other stuff. 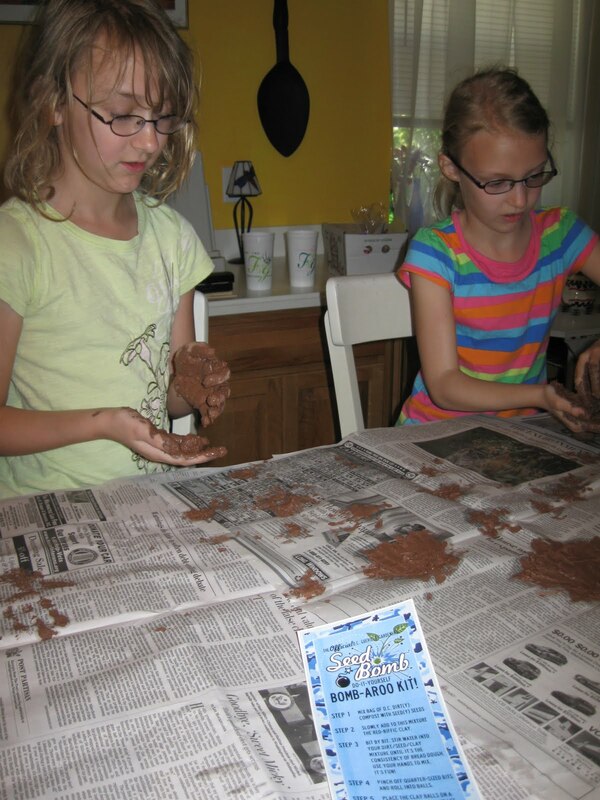 We made the clay mix too wet and it was messy, but it still worked. (It look kind of like canned cat food.) We rolled up the clay mix and it is drying in the sun now. The seed bombs will "grow" in empty lots all over the place. It was very fun and easy. Thank to DC Guerilla Gardeners for the seed bomb making kit. On Tuesday, the Washington Post ran an large article and photos on the front and back cover of the Metro section entitled "Garden to close for Masonic temple renovation." If you missed it, read it here. 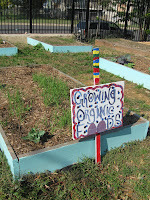 In summary, the gardeners had been given a community garden space on Masonic Temple property. The original agreement was extended at least twice and it has been gardened for a good run of 20 years. Now, the Temple wants the space back to stage construction renovations for their 100+ year old building. They have given the gardeners seven months notice and they will be able to garden through this November on the site. The Temple has also held out the possibility they can return to garden on the space at some undetermined time in the future (depending on how extensive the renovation needs turn out to be). While I'm sad to see another gardening space in DC go, I can't help but think the actions of these gardeners (and others like them who take their case to the media) are in the end very harmful to gardening in the city because other groups will definitely not be giving land over to community gardens (temporary or otherwise) knowing what is in store for them. The Masonic Temple should be thanked and celebrated for a wonderful two decades of generosity and not portrayed as the evil trolls who stole back gardening land. 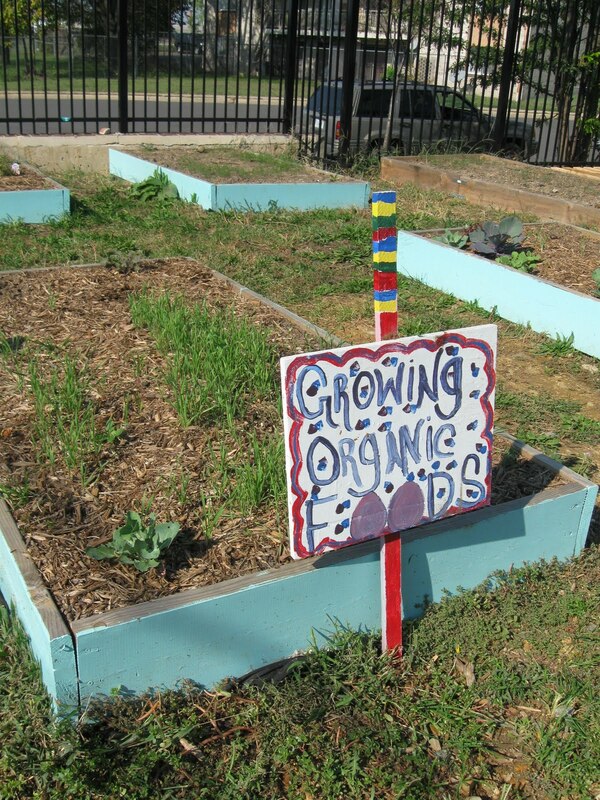 Personally, I have run into a brick wall over and over again in DC and the close-in MD suburbs when I have begged local developers, government departments, and churches to let community gardens use their land while it sat open for several years before their construction projects began. All flat-out refused, saying that even if they said "this is a 3-year or 5-year TEMPORARY garden space," they knew when that period was up they would have a bad fight and negative publicity on their hands. I discounted that saying if the temporary timing was declared at the outset that there would be no misunderstandings or negativity, but now, I have to say, they were 100% right. How can I in good conscience possibly ask another organization to set aside land for a community garden when this is how they will be thanked in years to come? Enjoy this Carolina Jasmine in full bloom today at the US Botanic Garden in Washington, DC. Can't you just smell it? Bookmark this page for next winter, when you need a reminder that spring does exist. Friends of the National Arboretum (FONA) recently announced a major fundraising campaign to save the Azalea and Boxwood Collections. 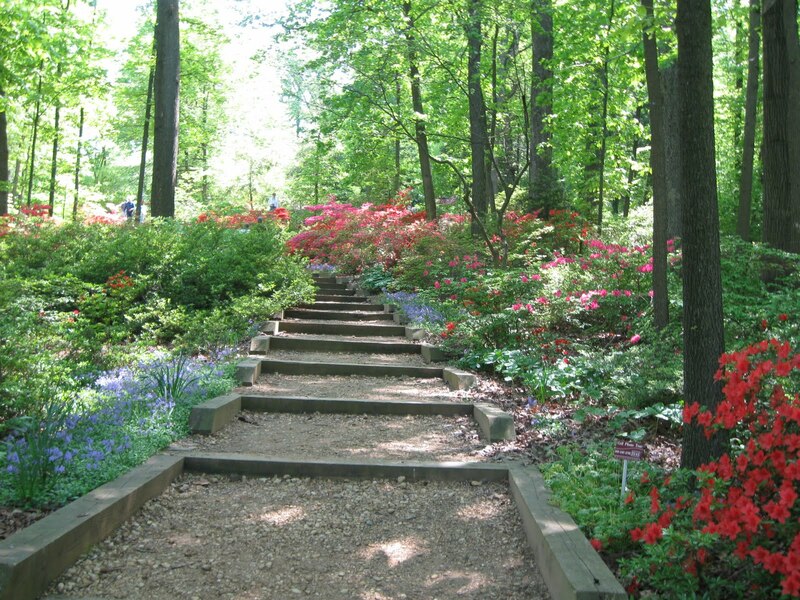 Tens of thousands of Washingtonians flock to the U.S. National Arboretum each spring to witness one of Washington’s premier springtime attractions: thousands of azaleas in a blaze of color during a six-week blooming period. However, the future of these collections is in jeopardy due to the loss of funds from a private trust. FONA’s campaign seeks to raise $1 million from individuals, families, and organizations who value and enjoy one of the area’s most magnificent and culturally important natural displays. Supporters can make donations via FONA’s website (http://www.fona.org/), or by mailing a check to FONA (3501 New York Avenue NE, Washington, DC 20002-1958, payable to “FONA Save the Azaleas Fund”). Credit card donations can be called in to the FONA office at (202) 544-8733. The Arboretum is free and open to the public. Hours are 8 a.m. to 5 p.m. daily. Check the “Azalea Blossom Watch” on the Arboretum’s home page (http://www.usna.usda.gov/) for blooming dates and conditions. Peak azalea bloom can vary, but usually takes place around the end of April. 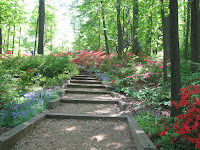 The azaleas attract many visitors to the Arboretum, especially on weekends, so you may want to consider visiting during the week or early in the day. Here is a video I made today right between breaks in the April showers of what is in bloom now in my garden. Some things, such as my Veronica groundcover, I had to skip as the chilly, overcast day had the blossoms squeezed shut and awaiting the sun to open up fully again. This will also serve as my Garden Bloggers Bloom Day post for April since the next few days will find me with little time in-office. Between training to be a Butterfly docent at Brookside Garden's Wings of Fancy exhibit to hosting a networking luncheon, spring has me hopping. I'm off to the Leesburg Flower & Garden Festival this weekend. I hope to see many of you there! This perfect color combination opened up in my garden yesterday. Wish I could say I planned it that way. The garden faeries must have done it, for I don't recall planting it -- certainly not on purpose. 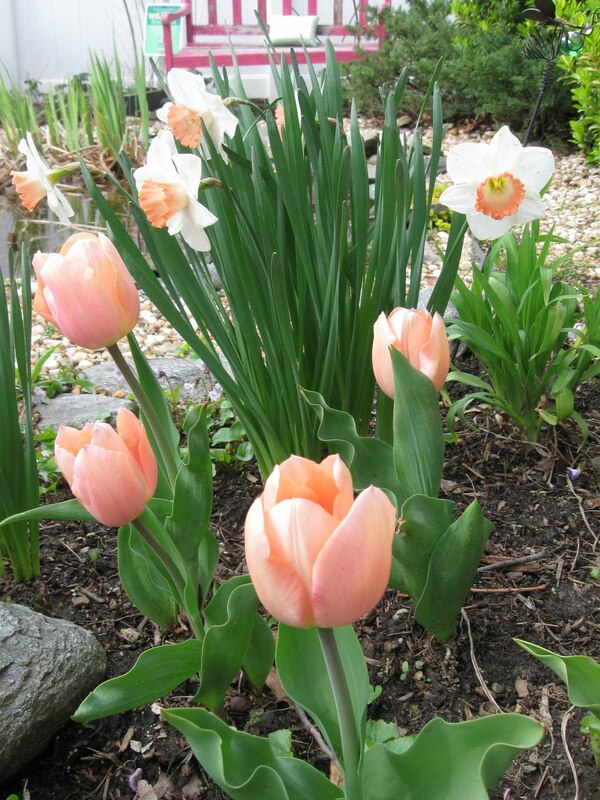 If only I could remember the names of this peach tulip and peach-cupped daffodil so I could purchase more and repeat the happy accident in adjacent planting beds. Earth Day is April 22, 2011. To celebrate, it's time for the 2nd Annual "Gardeners' Sustainable Living Project" started by Jan at Thanks for Today garden blog. Garden bloggers all across the world are sharing their sustainable garden practices. Use rainwater from your rain barrel to keep your yard green. Rainwater is ideal for yards, gardens, and flowerpots. Rain barrels can be purchased at your local hardware or garden supply store. Better yet, many local government programs offer them at reduced prices. For more information visit http://www.anacostia.net. Rain barrels are part pollution preventer and a money saver wrapped into one easy-to-install device. I have found my own English rain barrel that I installed over five years ago to be invaluable. During our late summer droughts, it helps store water for keeping all my container plantings going. Further, it lets me reach a distant corner of the garden without installing another hose hook-up. 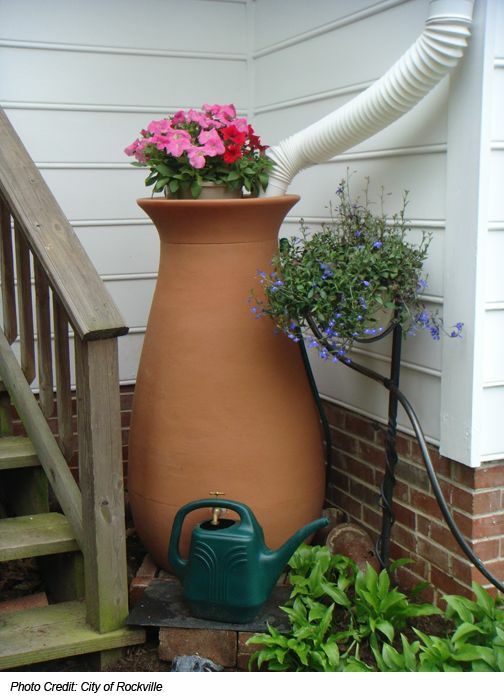 If you haven't already done so, consider adding a rain barrel to your own garden. I think you'll be very happy with this low-cost, easy device and so will our local watershed. Pictured here is a rain barrel in Rockville, MD. Photo courtest of the EPA. One of our multiple garden photo contest winners, William B Folsom, has offered to host Washington Gardener Magazine readers at Meadowlark Botanical Gardens in Vienna, VA, for a special early spring morning exploration. On Saturday, April 23, meet at 8 AM at the entrance gates to be let in early to explore the collections on your own. There is a $5 garden visit fee (or purchase an annual pass), please pay at the Visitor Center as you exit. ALSO, at 10AM to 12Noon William is offering a photography class (limit of 10 people) at $50 per person on Flower and Garden Photography. William B. Folsom Photography, LLC.